Should I study an MBA full-time or part-time while working? When embarking on a Master of Business Administration (MBA) course, most postgraduate students share two common goals: to advance their career and increase their earning capacity. Whether you want to climb the heights of the corporate world or see your own business thrive, the ‘why’ is usually clear. But what about the ‘how’? When deciding to complete an MBA while working, you may want to ask yourself some big questions: is working while studying full-time or part-time more achievable? Can you afford to take time off work? How will you study an MBA while working and meeting family commitments? What is the required time to complete a full-time or a part-time MBA? Can you commit to attending campus at set times? These are all important issues that require careful consideration to set you on the path to success. So, what should you consider when choosing between a full-time, on-campus MBA at Victoria University or a part-time, completely online MBA at Victoria University (VU) Online? Victoria University offers postgraduate students a highly respected MBA course developed by one of Australia's leading business schools. CEO Magazine’s 2018 Global Rankings awarded VU’s MBA a tier-one rating for its excellent lecturers, small class sizes, student diversity, value-for-money and international study options. At VU Online, specialist online learning designers have taken the on-campus course and redesigned it for the online learning platform. The teaching vision and business expertise are the same, but the content is tweaked to engage online learners. The online learning platform, VU Collaborate, considers that students will be accessing the course via smart devices whenever or wherever they like. An online part-time MBA is the same qualification achieved by on-campus full-time MBA students. In fact, your MBA certification at the end of the course will make no mention of your study mode. Both the online and on-campus courses at VU have a strategic focus on real-world learning and preparing students with the skills to achieve their career aspirations. Being able to manage your time is crucial to MBA study success. VU’s on-campus course can be completed in 1.5 years full-time, or over three years if you wish to study part-time. The time to complete an online MBA is 24 months part-time, just six months longer than the full-time commitment on campus. The shorter duration is due to VU Online’s intensive seven-week units, similar to VU’s new teaching model for first-year students that breaks the uni model. Accelerated online block units help students succeed because they are not spending time travelling to campus. Rather, students self-manage their study time and work it around their busy personal and professional commitments. 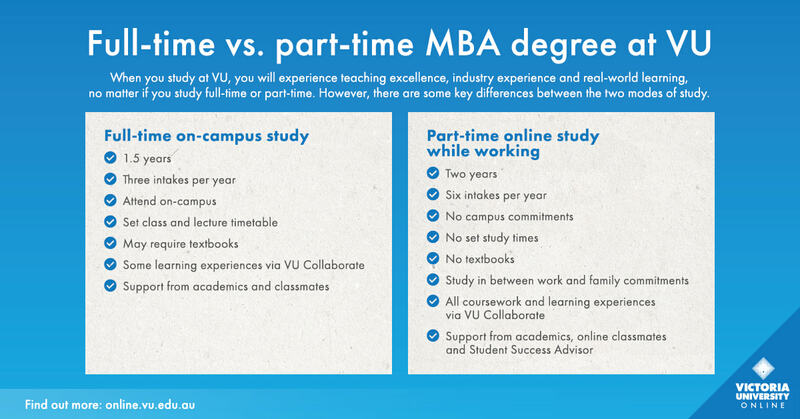 There are 12 units of study in VU’s MBA regardless of whether you study face-to-face or online. Many face-to-face students stop working and study four units at a time, with the year broken into two semesters and complete the degree in 18 months. Online students continue to work full time and take just one unit at a time over six study periods and complete the course in 24 months. Depending on your work commitments and how long you want to be studying for, a part-time online course over a full-time MBA on campus may be the way to go. Befitting the flexibility of the online MBA, the study model can be adapted to suit your lifestyle. When your work or family life is especially busy, you can choose to reduce your study commitments to allow some breathing space. There’s no place like…anywhere to study! We understand that attending on-campus classes every week is not a realistic option for many working people. Travel times alone can make the work-family-study juggle impossible. With VU Collaborate, everything you need for your MBA is easily accessible. You can study anywhere you have your phone, smart device or computer: on the train during your commute, during your lunch break, at home, or even while attending your children’s weekend sport. This course is open to domestic students who live across Australia or overseas. Victoria University offers its on-campus students flexibility by scheduling many of its classes outside of work hours, allowing students to juggle work and study. At VU Online, there are no set study times. You can access your coursework, assignments and learning resources 24/7. While the online MBA offers live seminars and gives you the opportunity to interact with industry and academic leaders, your online presence is not compulsory. You can watch these seminars afterwards and still benefit from the discussion and industry insights. Recognising that students may wish to study during their commute or lunch hour, VU’s learning designers have divided the course content into manageable 100% online ‘bite-sized’ sessions, which are ideal for those times when you may have just 40 minutes to study. For many students, studying full-time on campus is an exciting opportunity to engage with teachers face-to-face and build strong networks with fellow students. In the business world, these relationships can be both inspiring and strategic. There is also the comfort of being able to seek academic and peer support in person. How does VU address this in the online course? VU Collaborate is true to its name, creating a hugely supportive, social and collaborative learning environment. What’s more, students’ learning cohort will include future industry leaders from all around Australia and even the world. Chat sessions, online study groups and collaborative projects give students the opportunity to connect and learn from each other. With navigation and visual style similar to social media apps, VU Collaborate is a dynamic forum for building lasting professional connections. VU Collaborate also creates easy access to a dedicated VU Online support team. For every unit of study, each student receives personalised support and feedback from an academic facilitator. VU Online’s Student Success Advisors complement this support with practical and administrative advice for the duration of the course. With all this in mind, choosing the study mode that is most achievable and engaging for you will be the right decision. Get in touch with VU Online’s Enrolment team on 1300 043 531 to help you decide the most suitable option for you. How does an MBA benefit my employer?